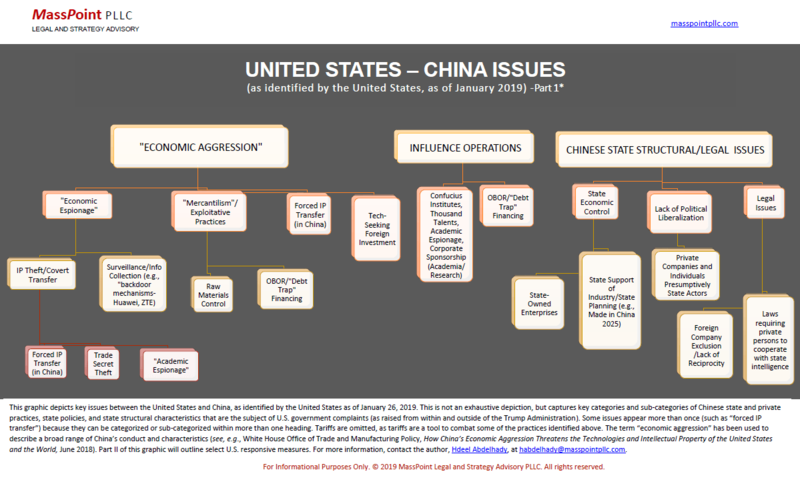 This graphic depicts key issues between the United States and China, as identified by the United States as of January 26, 2019. This is not an exhaustive depiction, but captures key categories and sub-categories of Chinese state and private practices, state policies, and state structural characteristics that are the subject of U.S. government complaints (as raised from within and outside of the Trump Administration). Some issues appear more than once (such as “forced IP transfer”) because they can be categorized or sub-categorized within more than one heading. Tariffs are omitted, as tariffs are a tool to combat some of the practices identified above. Part II of this graphic will outline select U.S. responsive measures. For more information, contact the author, Hdeel Abdelhady, at habdelhady@masspointpllc.com.